Early breakfast on the road and a cool brush by the breeze through my uncombed morning hair were the firsts on the list. As I help myself, rolling down the tinted passenger seat window, catching the first glimpse of what could be an opening of a perfect season after the long monsoon rains. With the windshield wipers no longer in use, the rain is now dripping down the glass pane. As I was urging myself on going somewhere distant, I am not sure if it is somewhere uphill but the road I am on was definitely taking me somewhere new. Something has gotten into me, a sense of urgency to take advantage while the world is still half asleep, a reckless abandon of some sort, looking for that great escape. I then looked up and see a lingering, thick contrail from the jet exhaust streaming across the stretch of the sky, a long vertical line that sketched the sky fluffy white. I checked my backpack for anything to munch on and found a half done sandwich that I had after a few beers. Everything is going neatly so far that the entire experience showers me with high hopes of leaving behind the remains of last night, covering the stench with a couple of hours of sleep later, hoping not to remember. And the day is already breaking. The world truly does not owe us anything. I was thinking that my only rescue now is to catch the first waves of the sun tides. 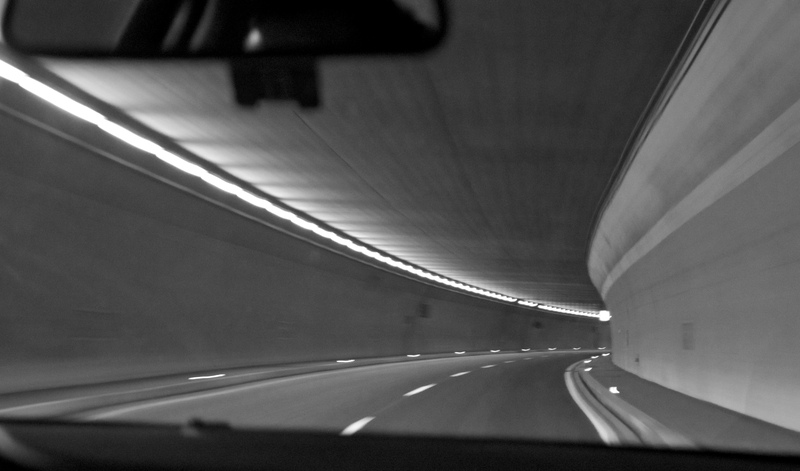 I was moving my head from side to side looking for a clearing from the open road by the cliff as we make a right turn after passing through the tunnel. We had to take a longer route since the fault was at its dangerous that time. My hands are shaking because of the cold, yet still very eager to create something beautiful with whatever the blotted ink from my pen can lend me. Yearning for a far cry inspiration, I picked out a past dated reading material from the dashboard compartment, popping the lid open with a hammering motion of my right fist. An old newspaper or was it a travel magazine? I can’t remember exactly, but It was dated sometime 2001. “Not bad” I murmured to myself, for it was like time traveling all the same and I can use that for reference I figured, giving an undeserving applause to myself. And somehow I realized that the course we were threading on was much better. It was from those after meal thoughts and the open-free spaces in between towns and the quiet celebration from a flick of my cigarette that validated this glide the right thing to do at the time. For it was by far the warmest after the cold. And the ease of the lift of my facial muscles seemed sustainable and could seem to last a lifetime. It really surprised me on how easy it was all of a sudden. A very good friend had once told me over a glass of rum, that our realizations and the wisdom that comes along with it, are all emanating from the affirmation that sometime soon after we are long gone, we will be just a part of a punch line in the short stories being told. It would probably start with a short visual reference from one of your favorite self-portrait photographs carefully placed in the family album or perhaps if lucky, you’ll be remembered when the index cards of the recipe box you once filled and treasured, was opened and used during some yearly household occasion. You’ll be in a way, like a transistor radio or a technicolor television set with giant capacitors and wooden shutters that was boxed and locked up in a room somewhere. I turned the knob of the car radio a notch higher while lip-synching to a plastic record, and for a moment there we were shaking our heads senseless and doing these random unrehearsed movements from our seats. We were, in our own weird ways, happy. Past the varying heights of the trees, while the sun is playing hide and seek behind each, and the varying shades of greens of the hills color the feeling, I can’t help but compare. That it was definitely a different view from what laid days before. The haunting and casting shadows on the moonlight floor were no longer there, and all of the episodes were nothing but of a distant memory now, in my chest to be safely kept and yet to be seen again but not now, not at this very moment. Through the fast open sky, and past the telephone wires that fenced the mountains and the slopping landscapes of the north and the infinite blue skies ceiling above us, I watched the wheels that spun so fast through the side mirrors, our speed made the white-highway-broken- lines appear to be this long and endless straight marker directing us towards the end and the beginning of a circle. Our tomorrows may or may not be there, but I will relish the flip of the coin, playing through over each finger as I tap my feet to the waltz of this familiar song. And somehow it felt like we were slowly getting off the ground, we were almost flying. A shift in perception or just an ordinary optical illusion, I could not really tell and it did not matter. For what I had there was not of this world and yet it felt it was. Twenty-two degrees on an 80 kph freeway for as long as I have my polarized lenses on, my past dated magazines and plastic records – I am there, crashing through the walls of the uncertainty of history, trying to live in a story worth telling.